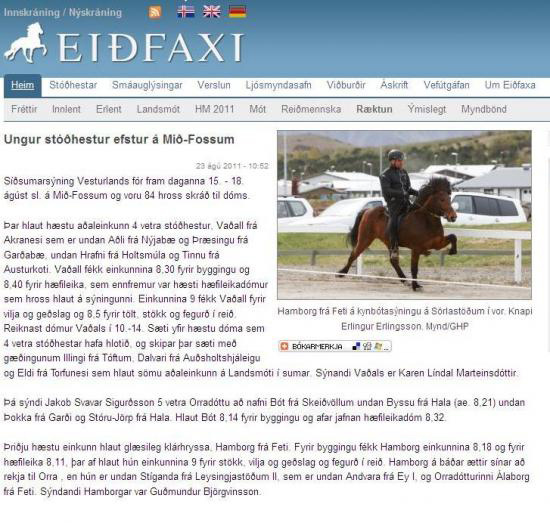 Our Hamborg frá Feti was in the news yesterday, on www.eidfaxi.is in a report on the breeding show on Mid-Fossar last week. Hamborg was the highest judged 4gaited mare there and on the top of her class, 6 year old mares. We are off course very proud of our excellent mare wich is breed by Brynjar Vilmundarson, previous horsebreeder on Fet. The results are even more important for us because Hamborgs mother, Álaborg, is in our possession and is one of our top breeding mares. We thank Vidja Hrund Hreggvidsdóttir and Erlingur Erlingsson for best possible training of Hamborg over the last two winters. Erlingur showed Hamborg with good results at Sörlastödum this spring with the total score of 7,99. We aimed for a breeding show again this August, so when Erlingur went to the WC to show we contacted Gudmundur Björgvinsson, the former rider of Álaborg (from LM2004 on Hella). They hit it off and went to Mid-Fossar to do a great show with three nines and the rest 8,5 in riding abilities. Thanks Gummi! Hamborg rataði í fréttirnar í dag, frétt um kynbótasýninguna á Mið-Fossum á eiðfaxi.is. Við erum náttúrulega mjög stolt af þessari fínu klárhryssu okkar sem er úr ræktun Brynjars Vilmundarsonar á Feti. Við keyptum hana svo til ótamda 4ja vetra gamla. Viðja Hrund Hreggviðsdóttir og Erlingur Erlingsson eiga veg og vanda að tamningu Hamborgar og þjálfun. Erlingur sýndi hana í 7,99 í vor á Sörlastöðum í fantaformi. En þegar Erlingur fór utan til að sýna á HM voru góð ráð dýr. Leitað var á náðir Guðmundar Björgvinssonar sem sýndi móður Hamborgar, Álaborgu frá Feti, sem er í okkar eigu. Það er skemmst frá því að segja að þau smullu saman og útkoman þrjár 9,0 og aðaleinkunnin 8,14.